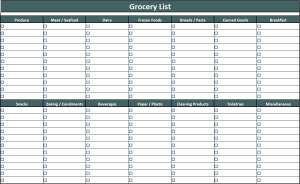 Use our FREE Grocery List Template to record what you need at the grocery store. 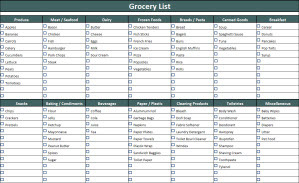 The template categories your groceries by produce, meat, dairy, frozen, breads, canned goods, breakfast, snacks, baking, beverages, paper, cleaning, and toiletries. Use the completed Grocery List below to get you started on your shopping. Or print the blank version and affix it to your refrigerator. As you need items, simply write them on the list. When it's time to go to the grocery store, you'll know exactly what you need, and your items will be categorized for quicker shopping! Click on one of the below images or links to download your desired spreadsheet. Choose "Open" to immediately open the template for editing, or choose "Save" to save the template to a location on your computer.